Former NYC police commissioner Bernard Kerik will self-surrender to a federal prison tomorrow to begin serving a 48 month sentence for crimes related to under-reporting the value of renovations on a personal residence and making false statements on his Homeland Security application. Bernie has just posted a "farewell" and "thanks" post, It's Time to Move Forward, on his blog. He's prepared to accept his fate, but points out in detail, it's not a fair one. For nearly three years, I prepared to go to trial to defend myself against substantially the same charges I had already faced in New York State Court. Then, just days before the federal trial was to begin, my bail was revoked and I was imprisoned. The judge threatened to disqualify my legal team, which both he and the government prosecutors had already done twice before and would have sent me back to square one for the third time with my savings now exhausted. Journalist Andrew Krieg writes at HuffPo that the feds bullied Bernie Kerik into his plea and the four year sentence imposed by the judge. My view is that the judge failed to protect Kerik's ability to mount a defense. We're all losers for this lack of fairness because all freedoms depend on justice in the courts. And for those (who often pop up in the comment sections of left-leaning blogs) who express satisfaction at Kerik's sufferings because he's a now-disgraced Republican, let's remember that Big Brother-style government is the issue here. It's not a good idea to applaud air bombing of neighbors. Update: Hundreds of tweets and articles and the first to report on whether Kerik goes to jail immediately or not is Tony Aiello. 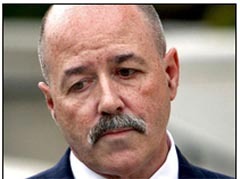 Kerik was granted a voluntary surrender to the designated prison, he will report May 17. Kerik was "the chief law enforcement law enforcement officer for the biggest and grandest city this nation has," Robinson said. The crimes were committed "in the process of attempting to become a cabinet level position in the government of the United States." Bump and Update: Bernie Kerik's sentencing is set for 10 am ET. I'm following on Twitter and elsewhere and will update with live reports from those on the scene. Federal proceedings are not televised but media is present. Former NY Police Commissioner Bernie Kerik is scheduled to be sentenced in a few weeks on his guilty plea to various tax offenses and false statement charges. Both sides filed lengthy sentencing statements yesterday. Both parties have agreed to a guideline sentence in the range of 27 to 33 months. The Government is clearly hoping for the max of 33 months. Bernie is asking for 27 months. Having read through the Government's 61 page sentencing memo and Bernie's (234 pages, including many letters), I have to wonder why the Government is making such a big fuss over 6 months. By pleading guilty, he saved the Government an enormous expense of time and resources that would have been required for a trial that would have lasted many months. Update: Judge says Bernie has done much good in his life and he will consider bail pending sentencing. For now, he will remain in jail. 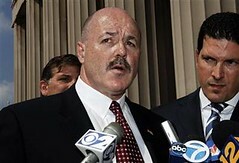 Jailed former NY Police Commmissioner Bernie Kerik pleaded guilty today to charges he lied to the White House on his application to become Homeland Security chief in 2004, after being nominated for the position by President George W. Bush. Kerik will also admit to tax evasion. The tax counts were set for trial separately. In all, he will plead to eight charges. Mr Kerik made the first of eight expected pleas at a court in White Plains, New York state, on Thursday. The admissions are part of a plea bargain designed to head off three pending trials on 15 federal counts. Mr Kerik had previously denied all charges. Former NY Police Commissioner Bernard Kerik will remain at the Valhalla County jail pending his trial on tax fraud and corruption charges. The Second Circuit Court of Appeals heard oral arguments in his appeal of the trial court's revocation of his bond yesterday afternoon, and then issued its ruling. His trial has been reset for November 9. Michael F. Bachner, one of Mr. Kerik’s lawyers, argued that Mr. Kerik should have been allowed to send documents to Mr. [Anthony] Modafferi because he was an adviser who wrote legal memorandums and offered advice on the coming criminal trial. In court, Judge Raggi sounded skeptical about that argument and appeared to side with Judge Robinson, who had said that Mr. Kerik attempted to obstruct the jury selection process when he sent the documents to Mr. Modafferi. “I’m not sure how we would find clear errors in Judge Robinson’s articulated concerns,” Judge Raggi said. The order is here (pdf). Bernie Kerik remains in custody in the Valhalla County Jail. His trial, which was supposed to begin Monday, has been delayed indefinitely. His lawyers filed an appeal today of the court's order revoking his bail. According to the trial court pleadings on PACER, the reason for revoking Bernie's bail was the Government's assertion that he committed a crime while on release -- criminal contempt, which they allege he committed by providing pleadings discussing non-public information to an attorney who had been advising him on matters related to his criminal case, but who was not a part of his criminal defense team, in violation of the court's 2008 protective order. The appeal will be heard by a panel of the Second Circuit on Thursday. Michael Wolf at Newser has a good take on why the media shouldn't forget about Bernie Kerik. Reason #1: Rudy Giuliani. The best way to keep Giuliani from becoming Governor of NY is to remind people about him and Bernie. [prosecutors] discovered non-public documents placed on a Web site affiliated with Kerik's defense. "I fear he has a toxic combination: self-minded focus and arrogance," the White Plains federal judge said. That combination shows Kerik feels "the end justifies the means" and that "the rulings of the court are inconvenient and are to be ignored," Robinson said. Revoking bail for non-compliance with a court order? I could see charging or jailing him for contempt of court, but what does leaking sealed case information have to do with his risk of non-appearance in court or being a danger to the community? His lawyer says he will appeal. A lingering question is, what did Rudy know about Ray and Bernie (not just Interstate and Bernie) and when did he know it? The Washington Post addressed that question yesterday. Larry Ray, who is now in jail on a probation violation, contacted WaPo reporters and shared Berie's e-mails (pdfs), photos of himself and Gorbachev in Rudy's office when Rudy was Mayor, as well as other documents previously shared with the feds when he cooperated against Bernie. [Rudy Giuliani's then- girlfriend when he was married to Donna Hanover, Judi] Nathan's detail was approved by the NYPD after a stranger made an unspecified threat to her. 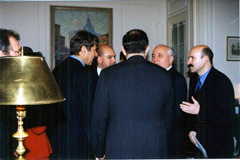 The commissioner at the time was Bernard Kerik, who was recently indicted on tax fraud charges in an unrelated matter. "It wasn't about her being the mayor's girlfriend," Kerik said. "The person spoke to her by name and made comments to her." Kerik signed off on all of this. Makes Rudy's support for Kerik, even after being informed of his alleged criminal activities, easier to understand.